On February 20th it's the World Day of Social Justice and this week we suggest some resources that might be suitable for marking it. There is also a reminder of some of our books and CDs for Lent and Easter. A collection of nineteen songs drawing on the biblical songs of justice, World Church songs of protest and praise, and songs of experience from late twentieth-century Britain. 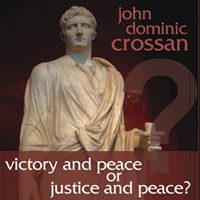 Including nearly four hours of dvd content and discussion guide, this DVD-based study featuring John Dominic Crossan explores the juxtaposition of Roman Imperial Theology and the Kingdom of God. Ideal for Advent and Lent. Flexible in format, Victory and Justice or Justice and Peace? can be conducted over 4, 6, 8 or 12 weeks. This item is one of the range provided by the Living the Questions organisation and is despatched from the USA. Digital download: A service of commitment focusing on the worldwide struggle for justice, of ‘defiant grief’, in the hope of one day reaching a tipping point in favour of the poor and oppressed of the world. A series of resources and complete liturgies for the major services of Holy Week. What would it have been like to be a pilgrim on the crowded streets of Jerusalem for that fateful Passover? What can we learn from the man with the water jug, or the Roman centurion? What can the woman with the alabaster jar tell us, or the young man who ran away naked as Roman soldiers tried to seize him? How did that first Easter change their lives? Modern, relevant resources to accompany readers through Lent and Easter for many years, with material for Shrove Tuesday, Ash Wednesday, Mothering Sunday, Palm Sunday and Holy Week, as well as suggestions for a Lent discipline. This book offers a wide range of resources that trace Jesus’ road to the cross through Lent, Holy Week and Easter, helping to enable the sense of hope, apprehension and joy of Easter as felt by Jesus’ friends. Tracing the sometimes sure, sometimes faltering steps of Jesus and his followers through the entire season of Lent, to Easter Day and then beyond, these songs allow us to reflect on their progress, enter their experience and ultimately to make their confusion, doubt, joy and liberation our own. John L Bell & Graham Maule of the Wild Goose Resource Group, together with fellow musicians, have made this recording of some of the songs and chants for Lent, Eastertide and Pentecost from their book Enemy of Apathy that haven't yet made it into other recorded collections. The traditional Lent period of repentance and penitence also offers an opportunity to see the world afresh. These readings encourage us not only to regard ourselves with a healthy realism, but also recognise the nature and purposes of God and the never-ending renewal of possibility, both within ourselves and in the world.